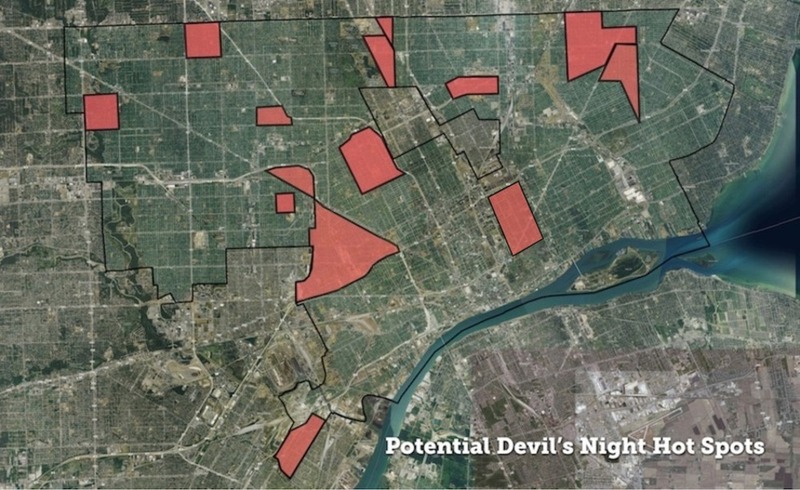 Loveland Technologies has assembled a citywide map to support this year's Angel's Night* efforts in Detroit. 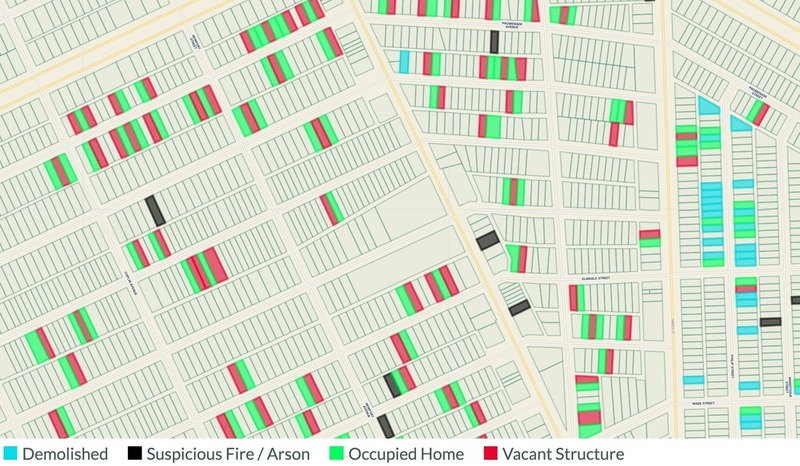 Hot spots experiencing higher rates of suspicious fires and arsons are identified, and we've included an analysis showing every occupied residential structure in the city with a publicly owned vacant structure touching any side of the occupied property. 10% of fires (167, from January 1 '15 thru August 1, '15) in Detroit over the past year have been “exposure fires” -- fires that spread from one building to an adjacent building. There have been more than twice as many fires categorized by the fire department as suspicious or arsons in vacant structures than in occupied ones (570 vacant, versus 251 occupied, from January 1 '15 thru August 1, 2015). Taken together, this indicates that vacant structures that fall within arson “hot spots” are at particular risk, and those adjacent to occupied homes within these areas warrant particular attention on Angel’s Night. 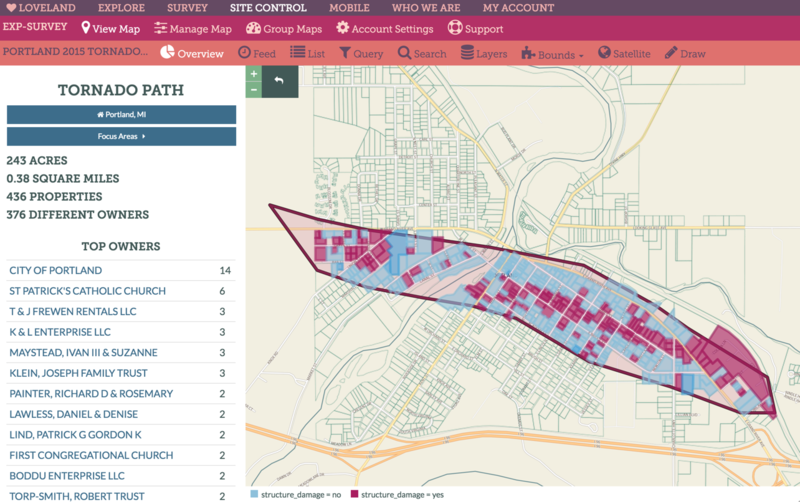 With the latest data available, citywide, Loveland identified approximately 11,700 occupied homes adjacent to approximately 8,800 vacant publicly owned structures. In the map below**, you can explore a part of the city experiencing a high concentration of suspicious fires and arsons this year -- the area bounded by I-94, I-96, and Dearborn to the West. To navigate to other hot spots within the map, click the "Focus Areas" menu in the left sidebar in the map above and then the boundaries of the area you want to navigate to. Also, hot spots are linked to individually at the bottom of the post. Additionally, for those coordinating Angel's Night activities by Council District, below are links to maps of each of the seven Council Districts -- all maps contain the information seen in the map above (vacant publicly owned structures, adjacent occupied homes, suspicious fires, and demolitions). Note that this map is not intended to be comprehensive, but to identify higher risk situations where occupied homes can be affected by nearby fires. Private vacant structures are also a significant risk factor when adjacent to an occupied home. 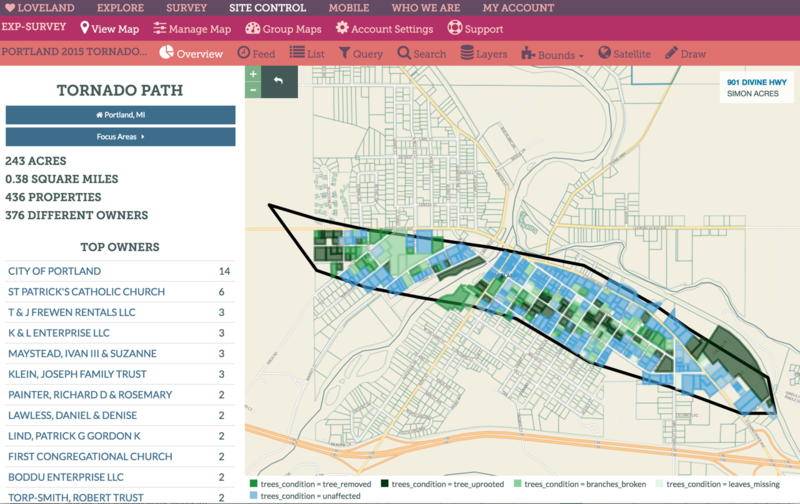 To explore and identify additional vacancies across the city, refer to Motor City Mapping. If you navigate to neighborhoods where Hardest Hit Fund demolition money is available, you'll notice a clear effort to remove vacant structures from next to occupied homes. 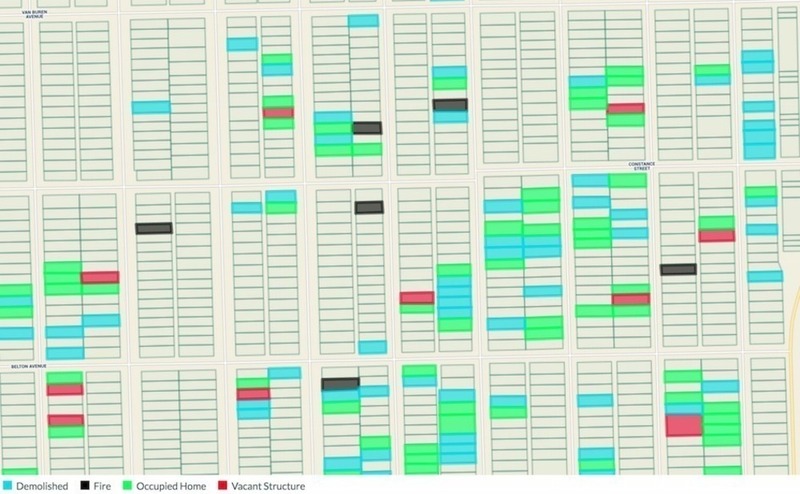 In the image below, blue properties are demolitions and green properties are occupied homes. A significant percentage of vacant structures, and potential fuel for arsonists, has been removed from the area by HHF demolitions. *- The night before Halloween - Devil's Night - has been associated with rampant arson across Detroit for decades. At its peak in 1984, over 800 fires were set in the three days before Halloween. By the mid-1990s, the annual destruction caused by Devil’s Night prompted community action and Angel’s Night was created in response. On nights leading up to Halloween, volunteers patrol neighborhoods and keep watch over houses in an effort to deter would-be vandals and arsonists. Angel's Night has been a huge success, credited with contributing to a significant decline in Halloween arson levels. 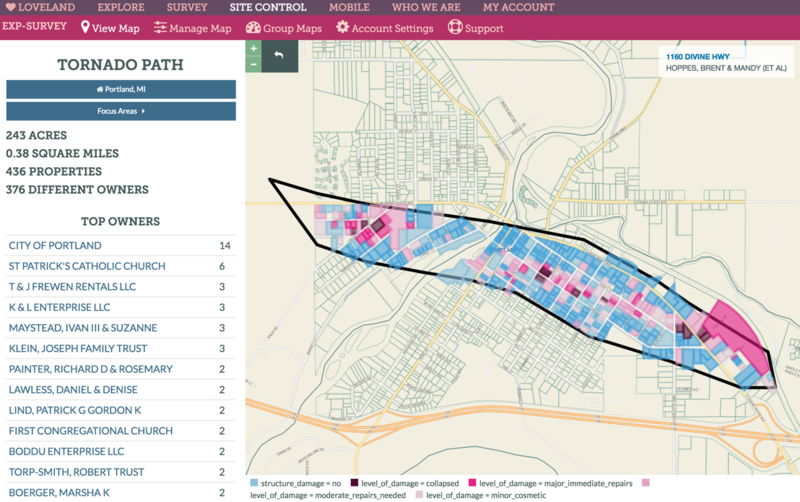 ** This map includes demolitions up to September 1, 2015, and makes use of occupancy / vacancy data from Motor City Mapping -- always verify this information in the field, especially as many properties have not been resurveyed since the initial winter of 2013 / 2014 survey. Fire data is assembled as a part of Loveland's ongoing fire tracking in 2015. For the last couple of years, the Evangelical Lutheran Church in America (ELCA) has been planning to bring 30,000 youth from all over the country to Detroit for three days of service projects. (You may have heard about the "Skittle Factory Explosion.") The ELCA reached out to community organizations throughout Detroit to set up the projects. In anticipation of the gathering, Focus: HOPE created the event's most ambitious project, ultimately employing 10,000 volunteers each day in an array of cleanup, board-up, mowing, and gardening projects in their 100 block revitalization area. Check out this video to learn how project director Jerrell Harris worked with colleagues and community members to use Loveland's survey app and data from the Motor City Mapping project (the citywide survey built on Loveland's Site Control technology) in creating maps, workplans, and strategies to effectively deploy resources. And... if you'd like to try out the technology yourself, head over to SITE CONTROL and take a look! We've got a great little video there to walk you through how you can make your own maps using Site Control. At LOVELAND Technologies we love Google Street View. Really, so much, it's all love. More than just an unprecedented way to drop in on almost any street corner in the country to see what's happening (as if that wasn't enough), Street View is a massive, and largely untapped, collection of street-level property data. 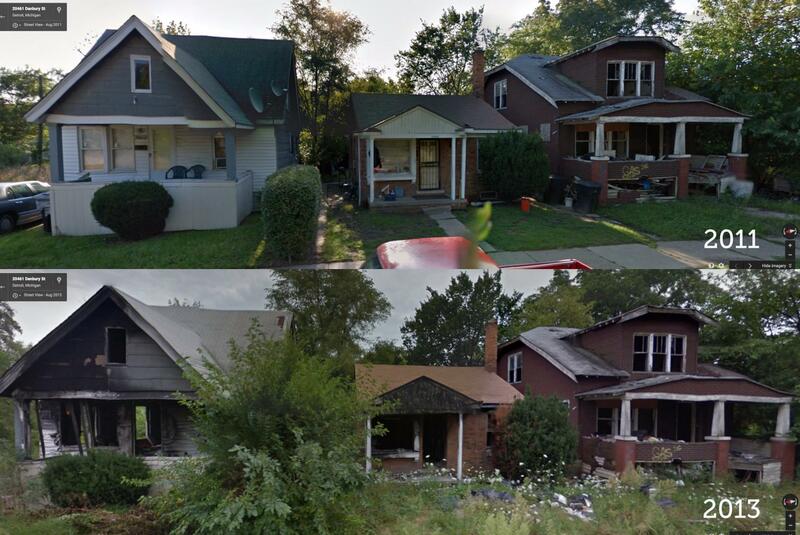 I use Street View extensively on my Tumblr, GooBing Detroit, to document the decline of Detroit property since the financial crisis. Street View's Time Machine feature, which allows you to go back and see Street View imagery for every year Google has driven a city offers an incredible near-past archeology of cities around the country. But, before I get into that, some background on the departure from Google. 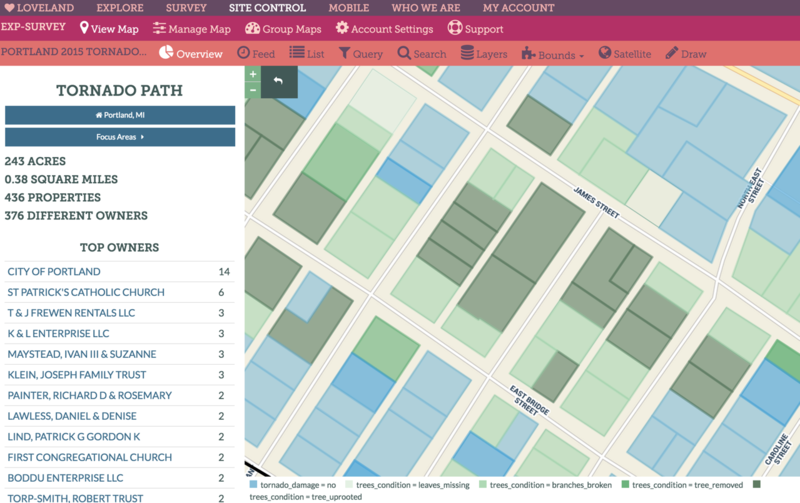 LOVELAND's base map comes from Open Street Map, and our map tiles are hosted on MapBox. We've spent years developing the system that supports LOVELAND's national parcel mapping, and the prospect of migrating to Google so we could continue using Street View was simply not feasible. So we spent most of the last month trying to reach the right person at Google to whom we could explain our situation. We felt that our mission to put every parcel of property in the country online, each augmented by a Street View image, the data and imagery available for free, was worth the exception that the word "generally" in section 10.1.1(g) seemed to imply existed. We were more than willing to pay the Maps API for Work subscription price to include imagery in our paid service, Site Control. Despite the valiant efforts of a number of current and former Google employees, we never seemed to reach the right person. It's understandable -- Google has 50,000 employees, and we're a tiny mapping company in Detroit -- I'm sure they have more pressing matters to address. Still, it would have been nice to have the chance to make the case for Street View in LOVELAND on the merits of our work and mission. 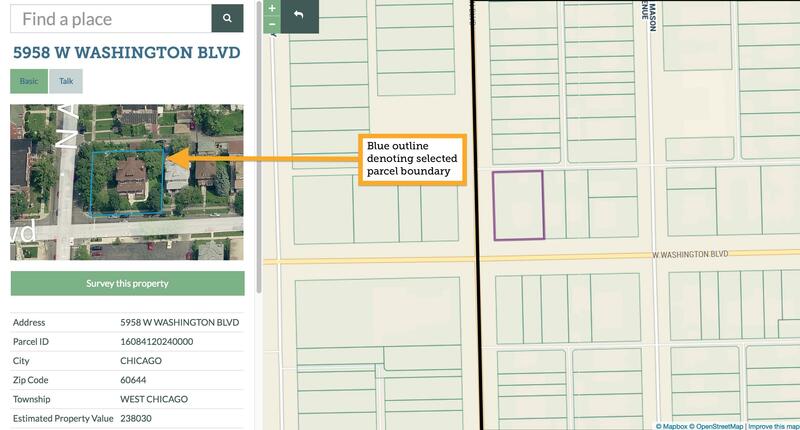 The Street View API often returns an image that is a parcel or two off from the one you've clicked on LOVELAND (an issue we seek to rectify through the Great American Parcel Survey, which actually lets you refine Google's API endpoint for a given parcel). With Bird's Eye imagery, we can outline the parcel you've clicked in the aerial image, so you know you're looking at the right place. When you hover over an aerial image on LOVELAND, you'll see rotate icons appear on the screen. Click those to see the property from each of the four angles Bird's Eye captures imagery. We're happy with Bing's Bird's Eye imagery, and for the channel it opens with Microsoft. We think Bird's Eye offers interesting new angles and insights on properties in LOVELAND, and we're glad that, should the opportunity open up to do more with Street View in the future, we know how to navigate both imagery sources, all towards the end of continuing to provide the public the best system in existence for understanding the parcel fabric that makes up our country. 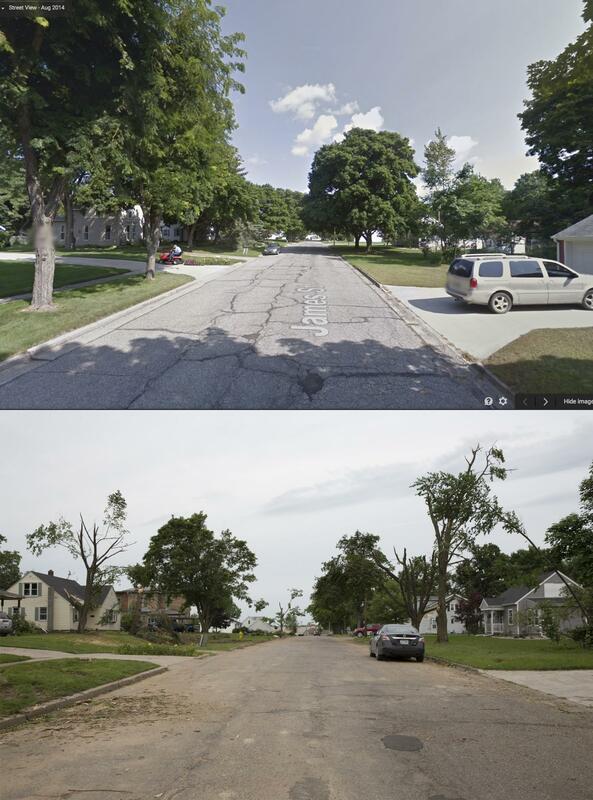 In June of 2010, the town of Millbury, Ohio was hit by an EF-4 tornado that killed seven and left over 50 buildings destroyed. As one of thousands of volunteers who helped with the cleanup, I saw firsthand the incredible damage caused by the tornado, and also the incredible efforts of first responders to bring order to a chaotic situation. Police, Fire, and EMS worked long days and nights to identify homes, help the residents, and coordinate cleanup efforts. The experience left a very deep impression on me. One of the guiding principles at Loveland has been how we can take parcel data and use it to improve accessibility to data. After the April 2015 earthquake in Nepal, we started to look into how parcel data and surveying could be used in disaster relief situations. First responders often lack basic information about structures damaged by storms or earthquakes, making it difficult to accurately assess damage. How could our survey technology and methodology be used to improve disaster response? On June 22nd, 2015, a large complex of thunderstorms moved across the midwestern United States, spawning 27 tornadoes, six of which touched down in Michigan. 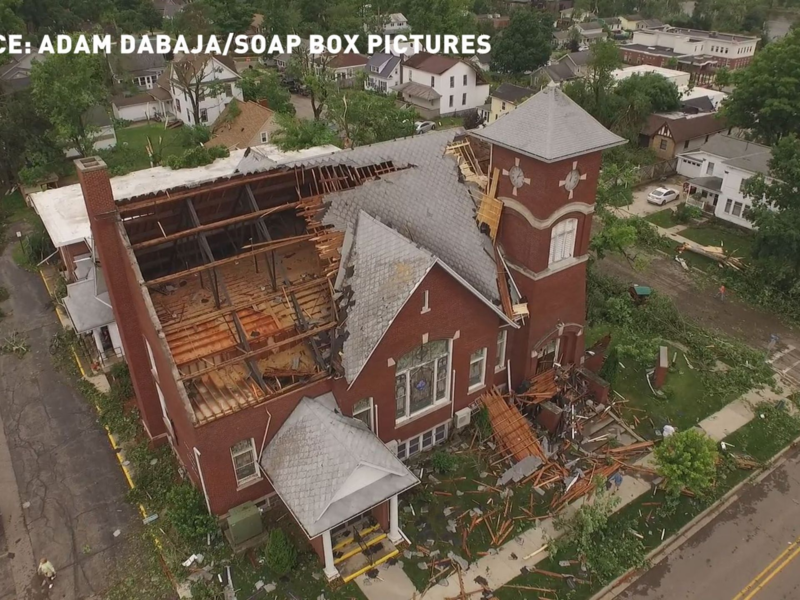 At about 2:30PM, an EF-1 tornado touched down about 3 miles west / northwest of Portland, MI, a small city of around 3,800 people, and cut across the city, severely damaging homes, businesses, and churches. 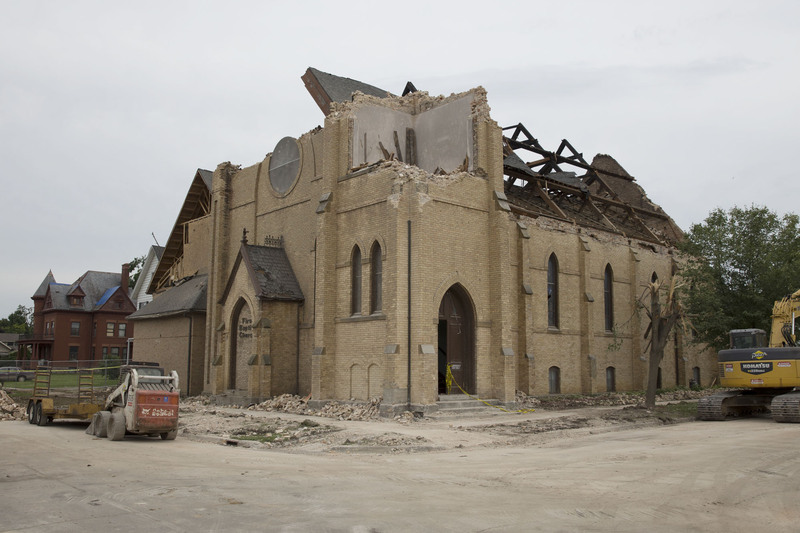 The first images from the city were stark and haunting: roofs ripped off of churches, collapsed houses, huge trees snapped in half or uprooted. Fortunately, only two people were injured, and there were no fatalities. The National Weather Service estimated wind speeds of up to 100 MPH. 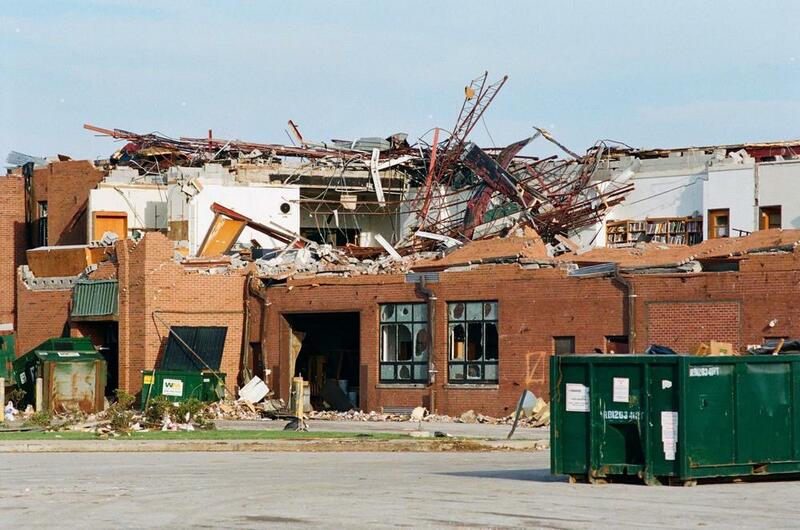 As with the Millbury tornado five years prior, our first instinct was to help. To that end, we began planning a survey of the tornado damage in Portland, with the goal of making this information available at no cost to first responders, academics, and the general public. The first step was determining the scope of the damage and what parts of the city would need to be surveyed. As the parcel-hunting team worked to secure the parcel map of Portland, we considered our survey options. Ultimately we decided against going immediately to Portland unless we could get authorization from a local agency, otherwise we might end up obstructing recovery efforts. Four days after the tornado, we drove to Portland to conduct a preliminary survey to establish the rough geographic boundaries of the damage and what types of damage we would need to survey. Using the information collected, we were able to draw an outline of where the tornado damage was located. Out of the 1,574 parcels in the city, about 500 were located in the path of the tornado. These would be the properties to survey. 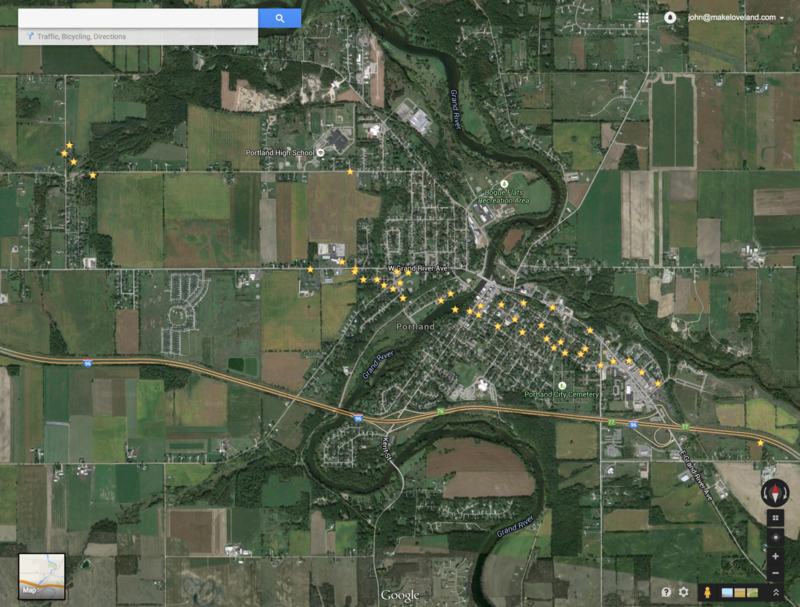 The parcel team contacted Ionia County and got the parcel shape file for Portland. With this uploaded to Site Control, we could now set up a survey area and questions. 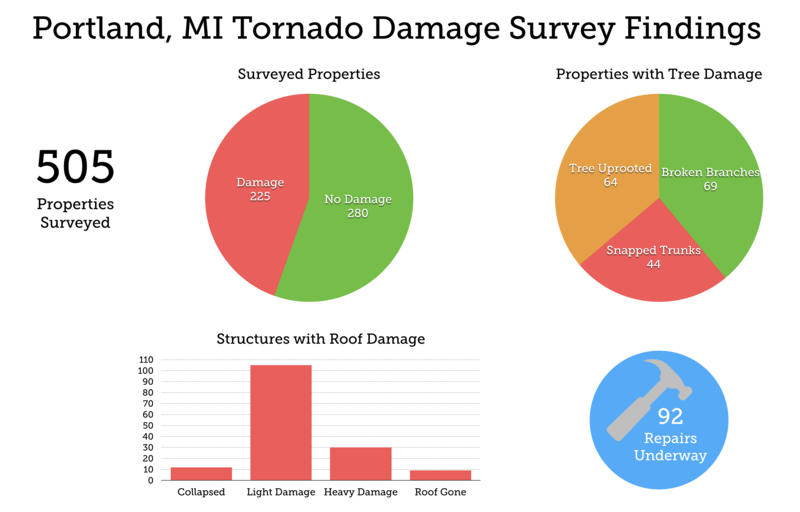 For the purposes of this survey we used the standard question set with a few additional questions to quantify specific types of damage - whether a structure had been damaged, how badly, condition of the roof and windows, and if trees had been damaged. Nine days after the tornado, we sent a crew of eight surveyors out to survey over 500 parcels in and around the path of damage left by the tornado. Teams of two surveyors fanned out across the city and surveyed all of the properties within a specific zone, taking pictures of each property, talking to residents, and looking for visible damage. This information was logged with wireless tablets using the Loveland app. It took about six hours to survey 500 parcels. What the surveyors found was damage ranging from broken tree branches to structures that had totally collapsed. Of the 505 properties surveyed, 225 properties had tornado damage of some sort. 156 out of 207 structures had suffered some structural damage. The severity of damage was concentrated along a thin corridor through the damage path. Buildings just outside the this path suffered minor or no damage. The level of tree damage was fairly consistent with structure damage severity. Properties that had uprooted trees suffered the worst structural damage, although some properties on the periphery with especially tall trees escaped major damage. Portland has a lot of old growth trees, many of which were snapped at the trunk or completely uprooted. Based on survey results, we found 156 structures damaged in and around the path of the tornado. Damage followed a fairly concentrated path, through which trees were uprooted and houses sustained severe damage. 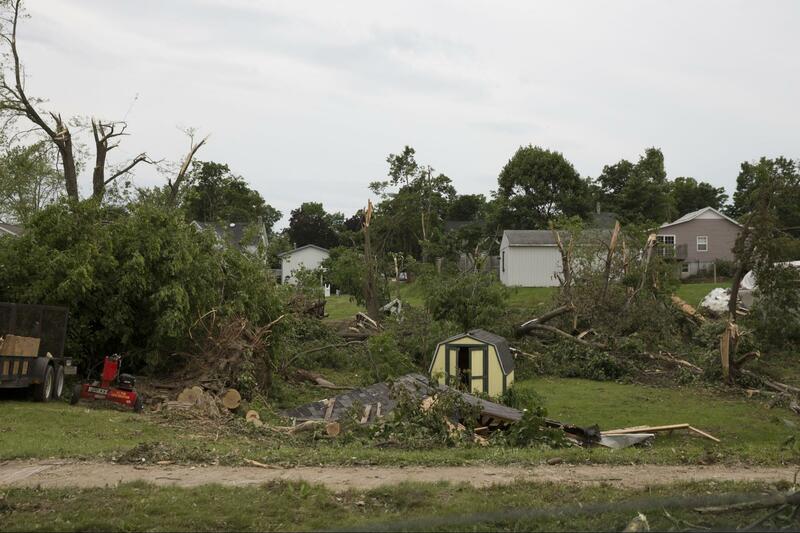 In other areas though the tornado seemed to have “skipped” over houses or streets, leaving them relatively undamaged - most notably on the west bank of the Grand River. There were limitations to the survey that make qualifying the accuracy of the data collected difficult. Not all structure damage was visible from the outside, as we found with some properties where the owners were able to give us more detailed accounts. The amount of time between the tornado and the survey - nine days - meant that much of the damage, especially tree damage, was already cleaned up by the time that surveyors got there. A more accurate picture of the damage would have been gained had we surveyed just a few days after the tornado, however, our presiding concern was that we not interfere with recovery efforts and give the residents of Portland some time to decompress. The experience we gained through this survey led to us making some changes to how we approach natural disasters and the questions we ask. 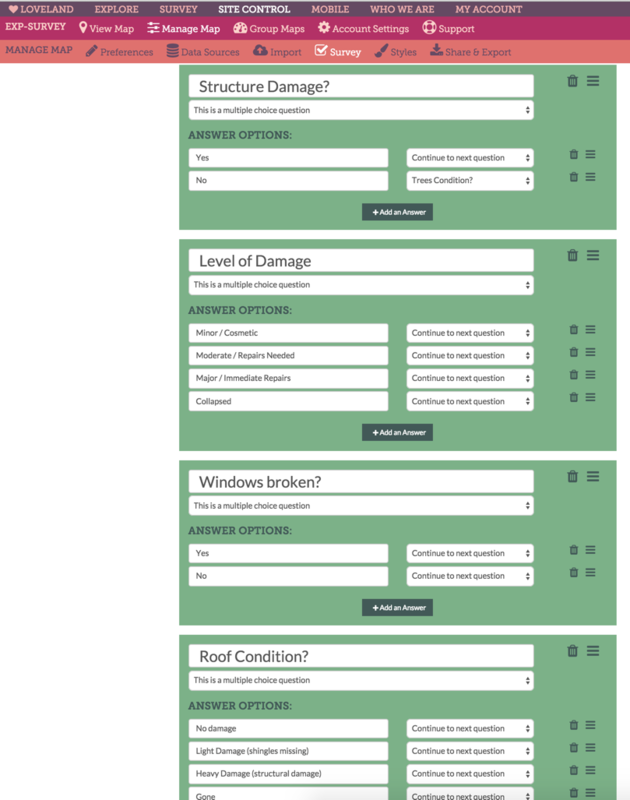 Specific questions about roofing and tree condition can provide useful information about wind speed. 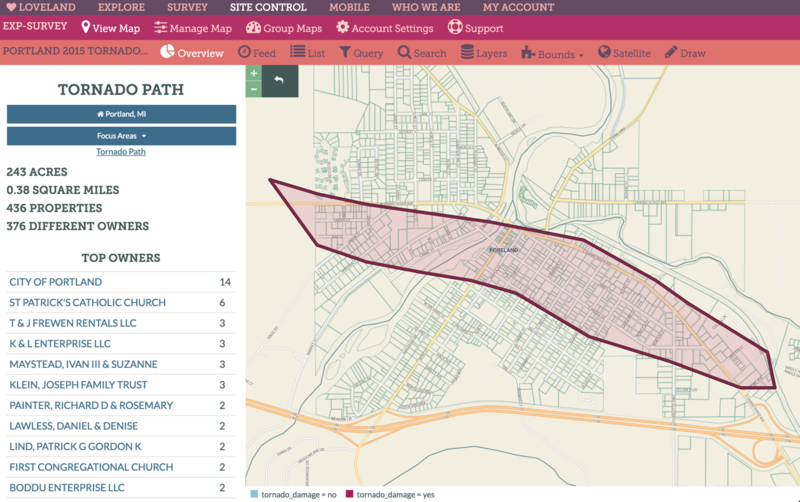 Future surveys will use more detailed questions, and also work with local residents to survey and upload real time information via the Loveland mobile map. Check out the full map here.